Managers have set next Wednesday morning for a full-up tanking test of External Tank ET-131 to test a potential solution to the leaking Ground Umbilical Carrier Plate (GUCP). 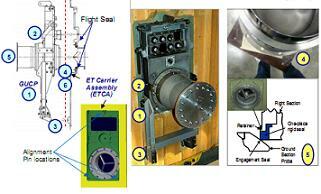 The leading candidate for the cause of the leaks is believed to be related to the External Tank Carrier Assembly (ETCA) mounts, a problem engineers had documented ahead of STS-127’s two scrubs. Following the scrub of the second launch attempt, engineering teams have been meeting in an attempt to find a root cause of the two leaks. Interim work has centered around taking measurements of the hardware at the pad, along with leak checks. “GUCP Troubleshooting: Weather impacted the teams’ progress last night; lightning, heavy rain, and high winds shut work down for the last couple of hours on 2nd shift and delayed start up this morning,” noted Tuesday processing information on L2. “In addition, weather is forecast to be a challenge. Strain gauges have been installed on either side of the GUCP Quick Disconnect. Also, boroscope optics were set up ahead of purge line fittings and guide pin evaluations before vent line disconnect and shroud removal – which began late on Monday. In pre-emption of a successful tanking test – due to start at 4am local time next Wednesday and end around 10am – waves of tankers have been arriving to top up the supplies of LOX that will be loaded into ET-131 during the third launch attempt, and the upcoming test. “LOX storage tank replenishment is planned to pick up tomorrow; four waves are scheduled to be off-loaded tomorrow and two are scheduled for Thursday,” added Tuesday processing information. The safing of the vehicle after the second launch attempt was scrubbed during tanking received praise from shuttle manager John Shannon, who was unable to attend the countdown due to commitments to present an alternative option to Ares I – which he wasn’t sanctioning – at the Augustine Commission. “Was a tough decision for Mr. Shannon to not be at second launch opportunity, but he needed to be at HQ and felt it was in extremely good hands,” noted minutes from this week’s Shuttle Standup/Integration report (L2). “Thought team did extremely good job preparing and working though the weather issues. Engineers have been evaluating several potential root causes associated with the leaks suffered by ET-131, and also STS-119’s ET-127. While most of the concentration has been focused on Endeavour’s tank, engineers do feel they have found the reason behind the tank’s problems when transitioning from fastfill to topping. The key area of interest is related to the two mounts, or feet, located on the tank where the GUCP hinge points attach. One – or both – of these mounts is deemed to be offset from their preferred location. “Have many folks across Agency supporting GUCP investigation. Appears to be going well. Appreciate folks at KSC showing us the hardware there. It looks like the ETCA plate that mounts (manually installed) to the ET is not properly aligned with the ET,” noted an Engineering overview presented via the Shuttle Standup meeting (L2). This problem has been found with six other tanks set to fly, although the misalignment on ET-131 is classed as “the worst”. Thankfully, the problem can be corrected relatively easily. “Two adjustments were made to get additional clearance to allow centering and alignment, but after both attempts, the feet and brackets were found way over to the right side and we were not able to align properly. “Appears the pyro and large QD interface and flight sealer (in an integral machined piece) are probably aligned very well, so the GUCP plate can fit to it. Issues with this part of the hardware is not a surprise to ET engineers, who note a “Material Review (MR)” (paperwork) was ‘written against it’ to class the hardware as acceptable. This was verified by the hardware passing leak checks, but under cryo conditions the problem appears to grow as side loading forces are induced. This is a viable root cause as issues installing the GUCP hardware on to the tank inside the Vehicle Assembly Building (VAB) were noted on both ET-127 and ET-131, as per Flight Readiness Review (FRR) documentation. Again, the problem related to the hardware suffering from centering problems during installation, due to the bottom hinge points loading up to one side. 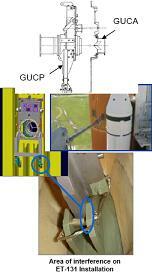 “ET-131 Ground Umbilical Carrier Plate (GUCP) Installation, Issue: Interference between GUCA and ET-131 right hand hinge support observed during mate/GUCP installation in VAB,” noted the FRR presentation, available on L2. “Installation sequence verifies contact with hinge supports and no interference between pivot assembly and hinge bracket. Interference occurred on RH (Right Hand) side of RH pivot assembly to RH inside of bracket. “Actions Taken/Status: GUCP was removed and different unit installed and interference remained. Both GUCP assemblies measured and within engineering tolerance. Inspection performed at KSC to assist in investigation of root cause. Now this misalignment issue has proved to be serious enough to cause a leak during tanking – as much as the tank passes leak checks at the pad prior to tanking – work will be conducted on the downstream tanks at the Michoud Assembly Facility (MAF) – to ensure GUCP installation procedures inside the VAB do not threaten to suffer from similar side loading problems. 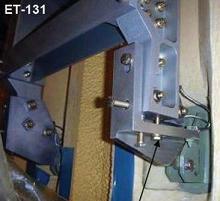 ET engineers are currently working on plans on how to “shim” the misalignment on ET-131, along with evaluations into a two part seal – which has been used in past to provide more compliance in joint. If the tank was to vent again during next week’s tanking test, managers will need to discuss the potential of a tank swap, which would involve Endeavour’s stack rolling back to the VAB for demating. Confidence is high that such a scenario will not be required.